While there are several options available today for rebuilding a patient’s smile, none are as lifelike or as long-lasting as dental implants. Why are they so successful? It’s simple – implants replace the ENTIRE natural tooth, not just the visible, white portion that’s known as the crown. With a new tooth root in place, the patient’s jawbone is able to remain full and healthy, and oral function is greatly improved as well. 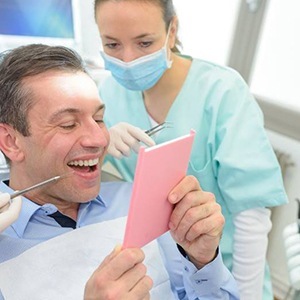 Better yet, our doctors at Jacksonville Complete Dentistry offer the entire procedure right here in-office for maximum convenience and comfort! If you’d like to find out whether or not you’re the right candidate for dental implants, just give us a call today. 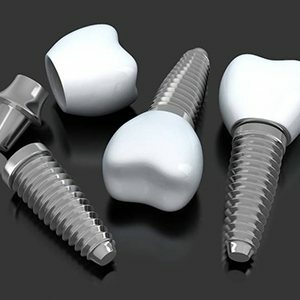 Why Choose Jacksonville Complete Dentistry for Dental Implants? Stability: Traditional tooth replacements just sit on top of the gums or lean on the surrounding teeth for support, but implants are anchored within the jawbone. This makes them extremely strong, so patients don’t have to worry about their new teeth shifting or breaking no matter what they are eating. Aesthetics: Implants are usually topped with white porcelain restorations and have no obvious metal attachments or clasps, helping them blend seamlessly into any smile. Bone Retention: The jawbone naturally starts to shrink and change shape after a tooth has been lost, and implants are the only treatment that can stop and even reverse this process. As a result, they not only help maintain the strength of the bite, but the overall shape of the face, too. Durability: With consistent oral hygiene and routine dental visits, a dental implant can easily be expected to last for 30 years or more. Most patients that have lost a tooth or teeth are ideal candidates for dental implants. The ability to replace a missing tooth with implants depends on a patient’s medical condition, the quantity of bone, the location and quality of remaining teeth, and a few other factors. We are happy to go over your replacement options, discuss their benefits and drawbacks, and answer any questions you may have at a FREE implant consultation. 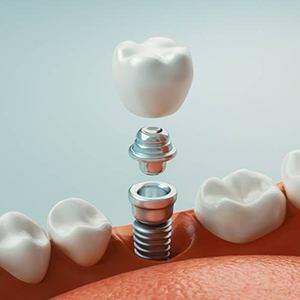 If you’ve only lost a single tooth and have an individual implant in need of restoration, a dental crown can do the job without negatively affecting the surrounding natural teeth. Your new crown will be crafted from tooth-colored materials for a beautiful, lasting appearance. While a traditional bridge is fixed into a gap by placing crowns over adjacent natural teeth, an implant-retained bridge is adhered with – you guessed it – dental implants! Two dental implants are used to anchor each side of the dental bridge, and a patient’s ongoing oral health is improved as a result. An implant-retained denture is ideal for patients who need to restore multiple teeth in the same area. The denture can attach to several implants at once, providing the same, reliable quality at a more cost-effective rate when compared to covering each implant with an individual restoration. Depending on the patient’s needs, this prosthetic can be truly fixed or it can remain removable in nature. 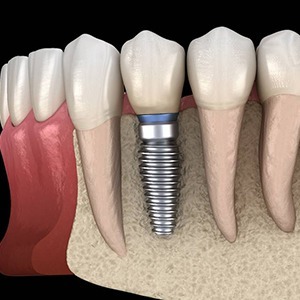 After you’ve undergone an initial consultation and our team has determined that you’re a good fit for one or more dental implants, we’ll need to start by surgically inserting the biocompatible implants into the jawbone. By doing so, we allow them to form a bond with your natural tissue and eventually create a rock-solid foundation for new “teeth.” This essential process, which is known as osseointegration, will take just a few months to complete. 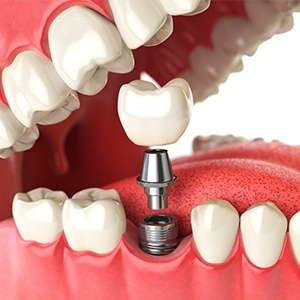 There are three parts to an implant; the implant itself, the abutment, and the crown. The implant serves as a root replacement. The abutment inserts into the implant after healing and serves to connect the implant to the crown. The crown is the visible portion in the mouth. The procedure is simple and often can be completed in less than an hour, often without the need of a single suture. After the area is numb, the implant is gently placed into the bone. Patients leave and can resume their daily activities. Our patients routinely state that they feel little to no post-appointment discomfort or pain and are generally surprised how simple it was. Once we’re satisfied that your mouth is healed, the patient will return to our Jacksonville location so that we can start planning their high-quality restoration. This restoration will attach over the implants and remain permanently fixed in place. Most other dental offices have to refer their patients to an outside specialist to have their implants placed, and this tends to add time, expense, and stress to the process of rebuilding the smile. At JCD, however, our team has the training to complete the entire procedure under one roof. 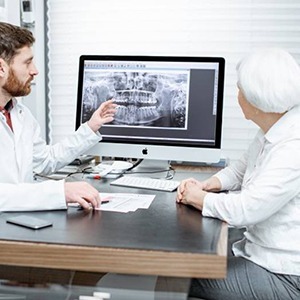 This makes getting implants much more efficient from beginning to end, plus patients can have the peace of mind knowing they’ll be able to work with the same dentist and team that they trust the entire time. 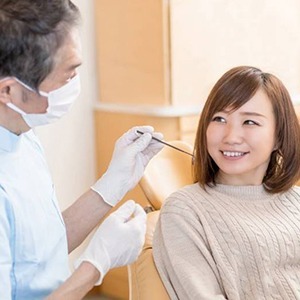 Because dental implants are able to help patients with varying degrees of tooth loss, the final cost of the procedure can be quite different from patient to patient. Individual factors such as how many teeth a patient would like to be replaced, where they are located in the mouth, and what kind of restoration is used can all make the procedure more or less expensive. 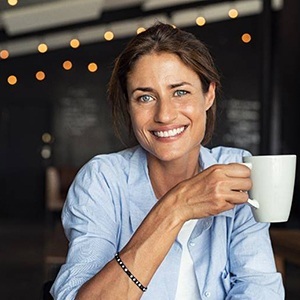 While it’s true that implant restorations tend to cost more than other traditional options, they are actually the best financial choice long-term. In addition to their superior function and aesthetics, implants also last much, much longer than other restorations. Regular bridges and dentures typically need to be replaced every 7-10 years, while implants have been shown to last for 30 years or more. A patient won’t have to get the periodic maintenance necessary with other restorations, saving them a lot of time and money over the years.